Ask a Lake Tahoe regular what it’s like to ski here and you might not get a straight answer. Unlike other snowy playgrounds, Tahoe isn’t a single mountain; more than a dozen downhill resorts cluster near the lake, a giant glinting expanse of shifting blues and greens so deep and vast that it never freezes. 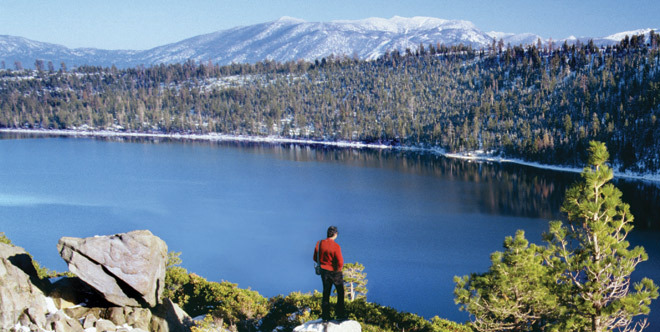 While the lake is exceptionally beautiful from any angle, it also has something of a split personality, with California to its west and Nevada to its east. Or even multiple personalities: Hopping from mountain to mountain, you can go from alpine glitz to NorCal earthiness to Vegas-tinged kitsch all in one stay. While après-ski partying is the little engine that drives many a ski town, South Tahoe subscribes to a more round-the-clock philosophy. Rambunctious and occasionally tacky, it goes big on nightlife with its army of casinos (MontBleu, Harvey’s), busy bars (MacDuff’s Pub, Après Wine Company), and all-hours dance clubs (Blu). Then there are the ski resorts. The 2.4-mile gondola ride from town up to the largest, Heavenly, is pretty dazzling. Lodgings vary wildly, but among the newest and most sophisticated is Basecamp South Lake Tahoe ($89-$329), a hipster-friendly 50-room hotel outfitted with bright orange kerosene-style lamps, reclaimed-wood furniture, and a rooftop hot tub—an epic improvement over its former incarnation as the snowboarder dungeon known as the Block. More grown-up still is the eco-chic 968 Park Hotel ($109-$419), opened in 2009, where the pub features organic beers along with high-elevation Rhône and bordeaux varietals from nearby Madroña Vineyards. Call ahead if you want to snag one of the 11 tables at South Tahoe’s most celebrated restaurant, Evan’s American Gourmet Café. For a morning detox of fresh fruit smoothies and veggie-packed breakfast specials head to Sprouts Natural Foods Café. If there’s an antipode to Tahoe’s South Shore, it’s Truckee. About 20 minutes from the north side of the lake, its stretch of 19th-century saloon-style bars and restaurants (Truckee’s best-known stop for ambitious American food, Moody’s, just got a revamp) is something you won’t find in other California ski areas. The menu at the Drunken Monkey, on the outskirts of Truckee, covers swaths of Asia, from sushi to Singapore street noodles. Tahoe Mountain Brewing Company recently opened a brewery in town as well as a brewpub 20 minutes away in Tahoe City, on the northwest side of the lake. That’s where you can choose from Belgian-style pale and dark ales, some brewed with Trappist yeasts and spicy peppercorns, while admiring the shore—and the French oak barrels that are filled with aging beer. You can make the detour there on the way back from Northstar, where people nurse post-slope drinks around the ice rink in the resort’s village. Forty minutes away, the Village at Squaw—a mountain famous for its steeps—has its own charms: fire pits, a spa, and the elegant Plumpjack Squaw Valley Inn ($230-$810), with 56 rooms, a popular New American café, and two outdoor hot tubs within snowball-throwing distance of the aerial tram. Back in Truckee, rest up at the Cedar House Sport Hotel ($160-$370), a minimalist, style-conscious lodge with cedar beams and leather platform beds. The hotel’s adventure concierge can organize custom cross-country outings. Because in a land where everyone else is zipping downhill, a little horizontal skiing may be the ultimate form of quiet rebellion. Getting there: Plenty of Angelenos make the eight-hour drive from L.A., but the one-and-a-half-hour flight to Reno-Tahoe International Airport is easier. From there it’s 45 minutes or so to Truckee, on the north side of the lake, and an hour and 20 minutes to South Lake Tahoe on the just-opened I-580 extension. From Sacramento International Airport, Truckee is two hours away via I-80 and two-and-a-quarter hours to South Lake Tahoe via Highway 50. Car rental agencies don’t always allow snow chains on their cars; rent a four-wheel-drive vehicle if you can. Speed freaks worship the North Tahoe resort’s trails, but Squaw appeals to all levels, especially given last year’s merger with Alpine Meadows. Newbie bonus: The easiest terrain is at the top of the mountain. Long a laid-back retreat for locals—backcountry explorers love its open boundaries—Alpine recently merged with Squaw, forming a 6,000-plus-acre ski area accessed with a single lift ticket. People used to come just for the widely spaced trees and mellow terrain. But the shop-filled village now hosts a bumping après-ski scene and a Ritz-Carlton ($299-$2,399). New this year: snowcat-skiing tours. Backcountry cat-skiing tours of Huckleberry Canyon beef up this midsize, six-terrain-park resort, a favorite with day- trippers. The resort shuttle hits hotels all over South Lake Tahoe. It was already known for its access from Reno and cruise-y trails. Then the resort upped the intensity eight years ago by opening the mountain’s north- facing chutes—with slopes of 40 to 55 degrees. Celebrated for its big acreage and watery views, the South Tahoe playground recently ramped up the after-ski party with DJs and go-go dancers at its mid-mountain Tamarack Lodge. This South Tahoe resort gets venerated snowfall and has backcountry terrain galore paired with offerings like a powder clinic, a cutting-edge ski school facility, and techy terrain-park features.